Here at Apprising Ministries I’ve told you before that Steven Furtick, who’s the spiritually nefarious prophet-leader of the highly influential multi-site megachurch known as Elevation Church, is without a doubt a leading member of a new Evangelical Ecumenical Magisterium (EEM). You’ve also likely seen me talk about how those who are succumbing to a growing charismania, such as Furtick himself, eventuality end up becoming bent in upon themselves. As they fall deeper into deception they end up thinking that their own thoughts are those of God; i.e. they fall in love with the self. As one whose background is studying cult leaders and their various cuIts, in my recent piece Financial Questions Surrounding Steven Furtick And His Elevation Church, I outlined for you how the office of vision-casting prophet-pastor operates today within apostatizing evangelicalism. It virtually guarantees that these cult of celebrity leaders will end up starting a cult. Briefly, the dutiful prophet-pastor first ardently studies the holy writings of the like-minded prophet-pastors who have gone on before him. Then, filled with his lofty dreams of megachurch church-planting stardom, the prophet-pastor starts meditating upon his hero’s works until finally the delusion arrives. Now the aspiring prophet-pastor has received his extra-biblical “vision,” allegedly from God, as to how it is he’s going to help make “God’s dream” come true. After that the prophet-pastor goes about selecting his hand-chosen yes men disciples and they accompany him before his followers congregation where prophet-pastor lays down the law casts said vision before this flock. As you can see from this 2010 piece at the Elevation Worship blog, I’ve not overstated the role of the cult-like vision-casting prophet-pastor. It’s bad enough when leaders of cult-like organizations hoodwink adults; however, it’s a whole other matter when such as these decide to target impressionable children. 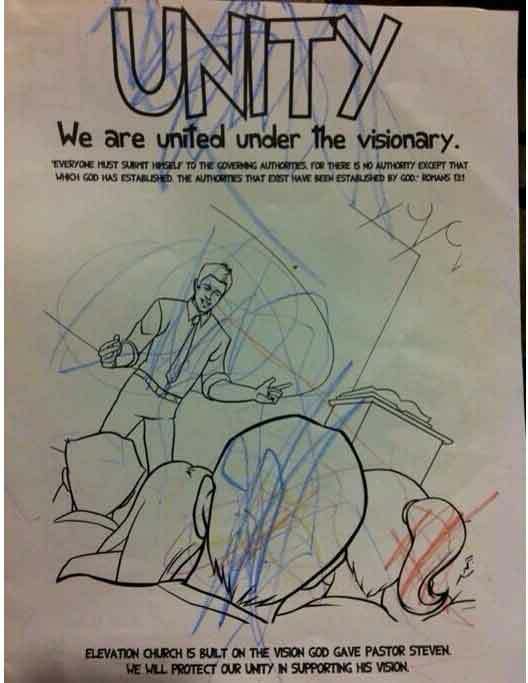 that she did illustrate this coloring book called “The Code,” for Elevation Church. Here are some additional drawings for the book which she created. The Code, by the way, is sort of like Elevation’s Apostle’s Creed, only it’s a creed devoid of what Jesus actually came to do; seek, call and save the lost through His shed blood on the cross. Evangelical leaders promote prophet=pastor Steven Furtick at their own peril. And lest you think he’s merely some kooky sideshow, I told you two years ago in Steven Furtick As Televangelist At Lakewood Church of Joel Osteen that Furtick already had enough clout to land Word Faith mogul T.D. Jakes, one of the biggest cult of celebrity propet-pastors in all of Christendom, to preach at his 2012 Code Orange Revival. You can see in Steven Furtick Grows In Stature And Closer To Word Faith Movement that at Twelve Conference 2013 Furtick preached alongside both Rick Warren and Bill Hybels, two of the best known gurus associated with the Church Growth Movement. Also at Twelve was Brian Houston, pastor of the nefarious WF outfit Hillsong Church with his wife pastrix Bobbie.